IDRC. Import Drag Racing Circuit. IDRC has been throwing import drag racing events for more than the last decade. Drag racing is fun, cheap to get into, and generally accessible for most people. However the last few years, import drag racing has virtually disappeared. Drifting, and now Time Attack has become popular, and we just don’t see the crowds of cars and people that we used to see at the import drag racing events. With that said, IDRC put on a great event at AutoClub Speeway in Fontana, September 4, 2010. It was hot, but its a dry heat, a desert heat, so they say it doesn’t really count, or hurt as much as a humid, Texas/Florida heat. Track temps were in the 125 degree range, shade temps were over 100 degrees. Tons of vendors, tons of cars for the car show, lots of cars making their way down the 1320. 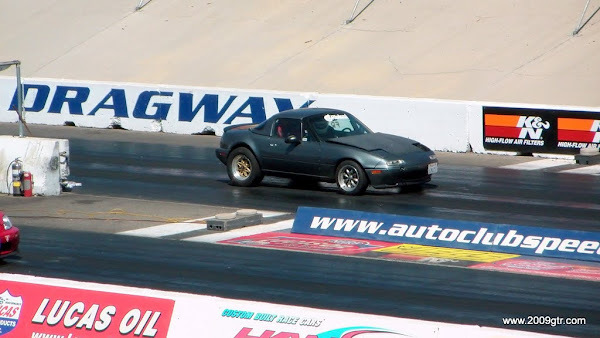 Here is one interesting car, an RB25 powered Mazda Miata. It makes over 400 whp, and I have some video of it going down the drag strip, that will be up on YouTube soon. SR20 Powered S13 notchback. Red is faster. Wakita and our favorite Jaonke Kenny were doing some trackside support for this street tired car. So JDM. ARC everywhere on this Evo. Top Secret TE-37 wheels. One of the classes for this event was drift cars going down the 1/4 mile. Ross Petty brought out his Boso S15. On slicks he was running into the 12’s. Kyle Mohan’s FD RX-7. Traction for the drift guys was a pretty big problem. Five Axis 370Z and Toyota Prius. Darton had a display showing their various sleeves, these being for a VR38. If you are looking for big power, and worried about the plasma sprayed bores on the VR38, then the Darton Sleeves are a great track proven solution. Easy Streets Street Tire WRX. This is one of the worlds fastest Subarus. It runs an automatic transmission to get it loaded and going down the dragstrip with the minimal amount of fuss. FD vs 240. Head over to Youtube soon to check out some videos from the event.